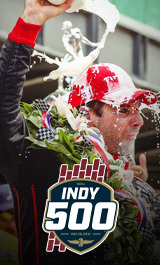 The 95th Running of the Indianapolis 500 took place Sunday, May 29, 2011 at the Indianapolis Motor Speedway. Canadian Alex Tagliani led the field of 33 drivers to the green flag. The race ended with one of the most memorable finishes in Indianapolis 500 history.